Hello friends! I am happy to report I survived my first week with students. This week I only had 4-6 per day on Tuesday through Friday, so it was pretty easy! Starting Monday, they will all be there and I will be totally exhausted at the end of each day for the first few weeks. It takes some time to get kinders to learn all the rules and procedures. For you non-teachers, procedures are those things you have to train the kids to do...like how to enter the room and where to put their things, how to push in their chairs and sit on the rug, how to act properly in the bathroom, how to walk in line without touching the person in front of you, and about a million other things...;) So, while I still have a bit of energy, I thought I would share the part of the renovation that I gave a sneak peek of on my blog tour on Monday. 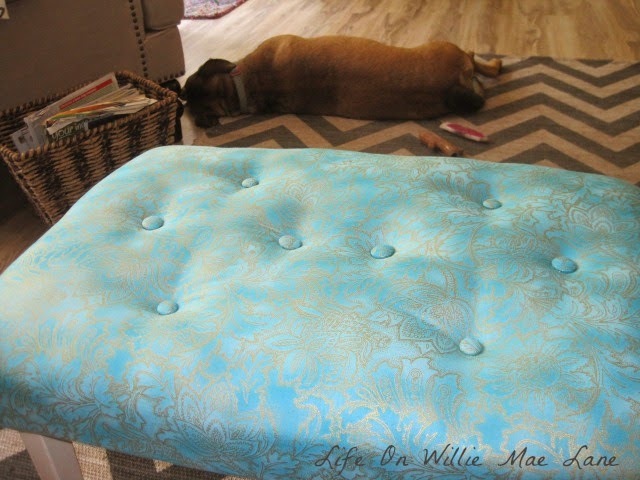 Several months ago, my sweet blog friend Magali shared this project she did in her cottage. I fell in love with it and immediately knew I would do something similar when we started our renovations. Here's a photo of Magali's wall with built in shelf. You can read her post here. If you don't already know Magali...I highly recommend you pay her a visit. She shares updates to her little cottage, photos of her sweet kitties, yummy recipes, and she takes you on trips around France. I so enjoy my visits with her...:) Thanks so much Magali for giving me this idea. Here's my opening with my shelf. While mine is not just like Magali's, it is very similar and I just love it! My shelf drops down around 12-14 "...can't remember for sure, and the hubby is gone to the races so I can't ask him. 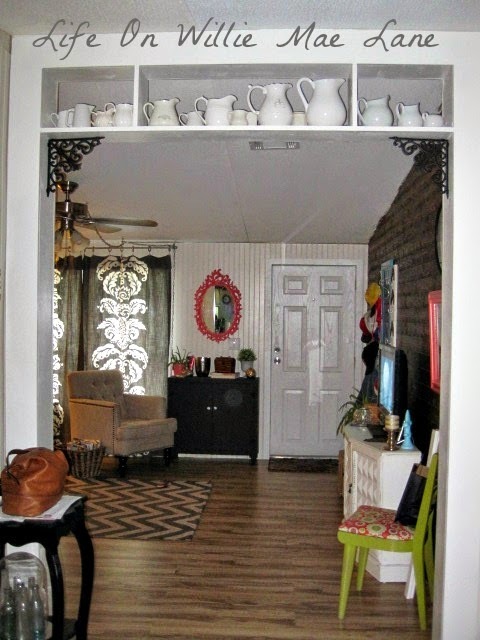 I never liked this big opening between my living room and dining room, but now I love it! 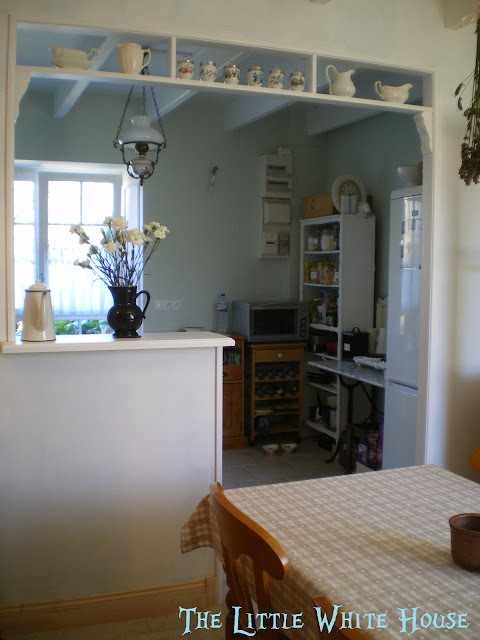 The photo below is taken from the dining room side. You can see my front door and the plank wall on the right with my entry area. That white spot on the door is a reflection from the entry mirror. You can see a peek of my new curtains in the living room as well. This is taken from the front door. You can see the same curtains in my dining room. I have two windows in there, one on either side of my china cabinet. I will share more of that room soon. We still have a few things to finish in there, like trim and hanging the chandelier. I also haven't found a table I like and we may end up building one. Anywho, the arrow in the photo points to where we stopped with our bead board. When we remodel the kitchen one day, we will be tearing out everything and starting over from this point. The bar will be bumped out closer to the window with a wider overhang for bar stools. I have lots of plans for the kitchen, but that reno will have to wait a while. We still have to reno our master bathroom and bedroom first. See the little black table on the right? I don't think I shared it and this area yet. The little table holds my phone charger and purse and is where I drop my mail for a few days until it makes it to my desk in the craft room. 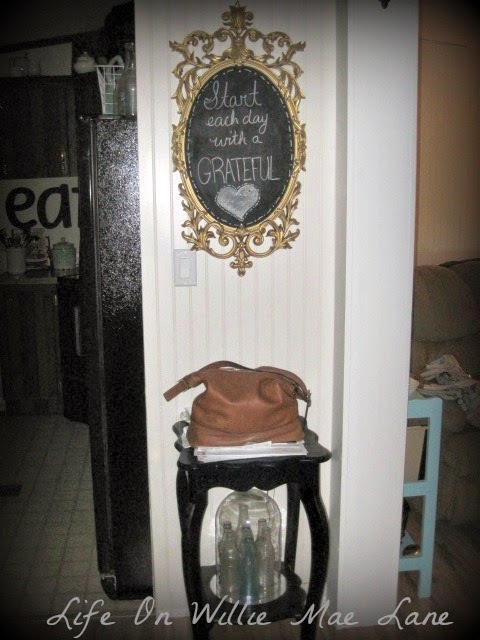 The gold chalkboard is a mirror that used to hang in my living room and was painted turquoise blue. I just took the mirror out and spray painted the backside with chalkboard paint. That way, I can still use it for a mirror when I get tired of this. I am really into gold lately, so the turquoise went away and I love how it turned out. Here's a shot of the opening from another angle in the dining room. You can see that my new built in bookshelves are to the right of it. 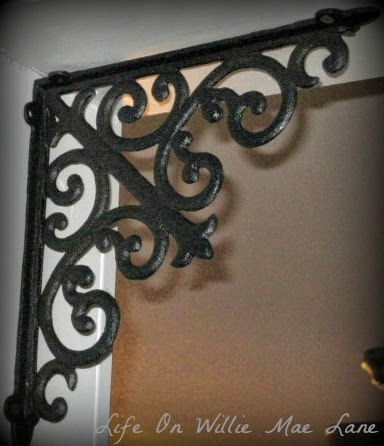 I love the cast iron brackets I found at Hobby Lobby. I had a 40% off coupon and a $20 gift card, so for two brackets and a cast iron anchor for my gallery wall, I only paid $1.20 out of pocket! Great deal! The brackets were just over $8 each which I though was a really good deal even without a coupon. Here's another little update on my plank wall. We hung my print and clock to the right of the TV stand. We really want a larger flat screen and are hoping to get a good deal during the holidays. It may be mounted on the wall, but I haven't decided yet. So, that's it for today. We are slowly finishing things up, but are having to save a bit to totally finish. That's OK though since I have been so busy with school. We were also getting a little burned out on all the work, so it's been nice taking a break from it for a bit. The hubby has enjoyed having time to piddle on his race car and clean and organize his shop. It had been neglected for weeks. I'm off to finish up a few things for school and enjoy my night at home alone. I can watch what I want to on TV and just relax in my pretty new living room. I hope you are having a wonderful weekend. When my blog buddy Tuula invited me to be a part of the blog tour that's been going on here in bloglandia, I was honored and excited! I immediately said I would do it because it sounded like fun! I'm all about fun! 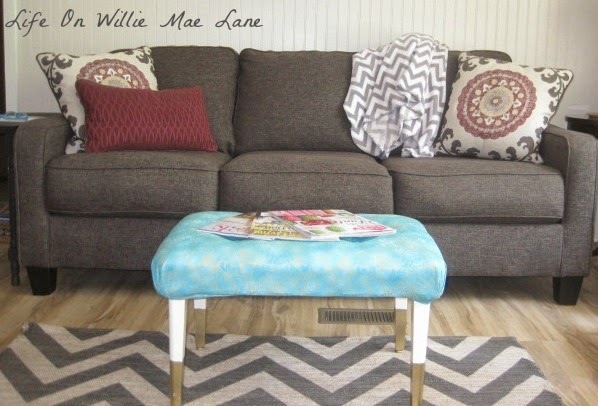 Tuula and I share a love of vintage things and we both like to take a lot of those things and transform them into something else or at the least, give them much needed updates. Tuula is the queen at transforming things into unique, one of a kind items. Just check out these gorgeous plate flowers. I'm always excited to read her latest post so I can see what awesome project she has been working on. Lately, she's been redoing her master bedroom. It is looking so good! I love the colors she is using to decorate. They are so bright and cheerful! 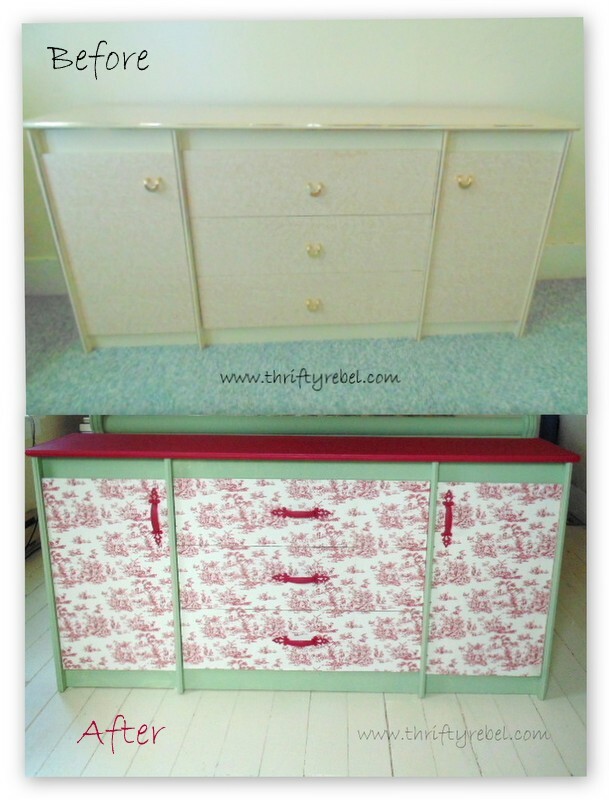 Just check out her funky toile dresser she recently redid! In addition to turning her vintage finds into treasures, she also has gorgeous garden spaces in her yard. 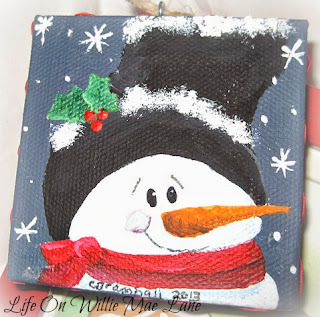 She creates some beautiful pieces of art to place throughout her outdoor spaces as well. 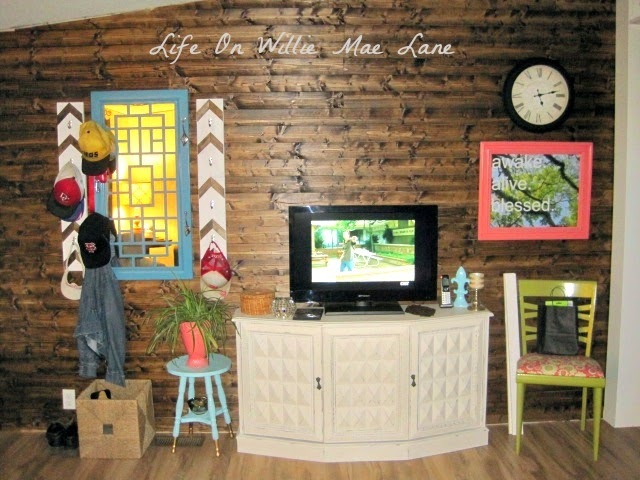 I love this most recent vignette she created. Go check out how she did it! Tuula also sells some of her treasures. You can visit her Etsy shops, Spoonfuls of Whimsy, where she sells the whimsical items she creates from her found treasures. She also has Thrifty Rebel Vintage Collectibles which features vintage items of all sorts. 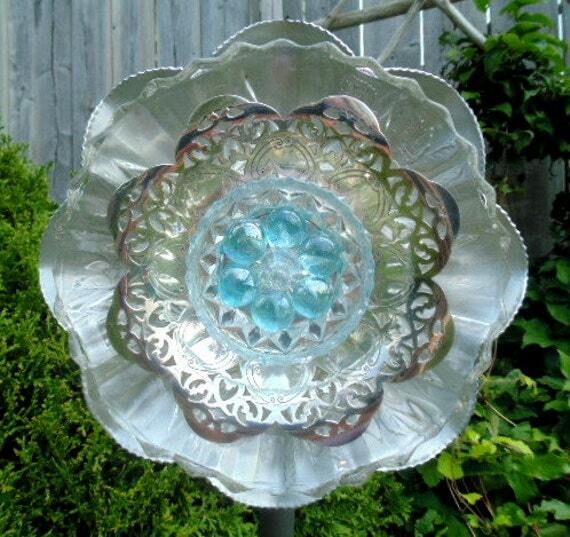 I love this gorgeous plate flower in the Spoonfuls shop! You can read Tuula's blog tour post here. Go by and give her some love. If you've never visited, you're in for a treat. Now, it's my turn to share! I am supposed to answer four questions. I'm a teacher...I'm used to asking the questions...lol, but I will try to answer them to the best of my ability. So, here we go! OK...let me try to answer this one quickly. 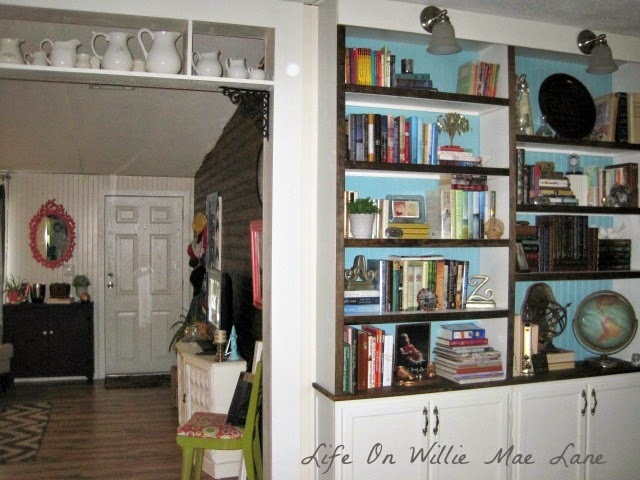 I (along with my hubby) have been working on renovating my living and dining rooms in my mobile home. For those of you who are new here, I live in a 24 year old double wide mobile home. That's a home that's built somewhere else and delivered to your property when complete. We were planning to build a house in the future, but since now is the future we had planned to build in, and we don't want a mortgage at our age, we opted to renovate what we have. It has been a blast! We get to do what we want and pick out what makes us happy. So, with that said, here are a couple shots of what we've been up to. 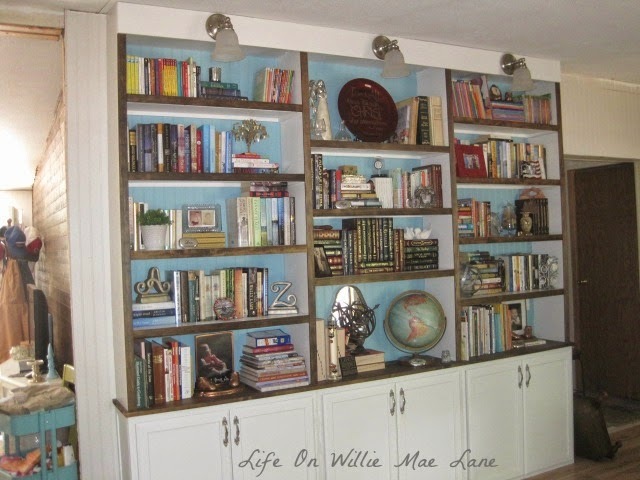 First up is the built in bookcase that I am in LOVE with! You can check it out here. Next up is a project I haven't shared yet. I will blog about it soon, but here's a sneak peek! 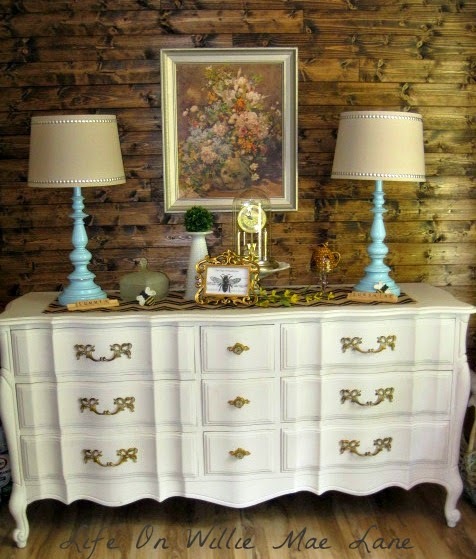 You can see the entry I created here and my dresser turned buffet project here. This one is a tough one to answer for me. I mean, in a way, I think we are all different, but in other ways, I feel we are the same. I mean, I create what I love. Sometimes it may be something I came up with on my own, and sometimes I may create something similar to a project I saw online. One thing I do know is I create what makes me happy. I don't care if anyone else likes it. If it makes my heart happy, then that's enough for me. I don't try to keep up with all the current trends, although I do love some of the current trends and incorporate them into my decor. My decor is very eclectic since I mix old and new, trendy and vintage all together. it's what makes me happiest. I love a mix of things....just look at my new buffet area in my dining room. I took the vintage French Provincial style dresser from my bedroom, chalk painted it and placed it in from of my trendy new plank wall. I topped it with vintage milk glass pieces, two old repainted brass lamps topped with new nailhead trimmed shades, scrabble tile words, an anniversary clock my mother in law gave me years ago, an antique candy dish that belonged to my granny, and a few other odds and ends. Above it hangs a thrifted print that I fell in love with! So, I guess my work isn't all that different, it just fits in several different genres. Does that make any sense? If not, just pretend it does and let's move on the question 3! Well, this one's easy for me! I write and create what I do because I love it. My blog is an online journal of sorts for me. I am documenting my life on here. My blog is a lifestyle blog. I don't share just one type of post like many bloggers. I might share my thrifty finds one day, and a new recipe the next. I may share vacation photos, furniture makeovers, my grown up children, my sweet Sadie Lou, or some kindergarten fun. It's always different....it's my life folks. Life changes daily and I just share what's going on with mine. 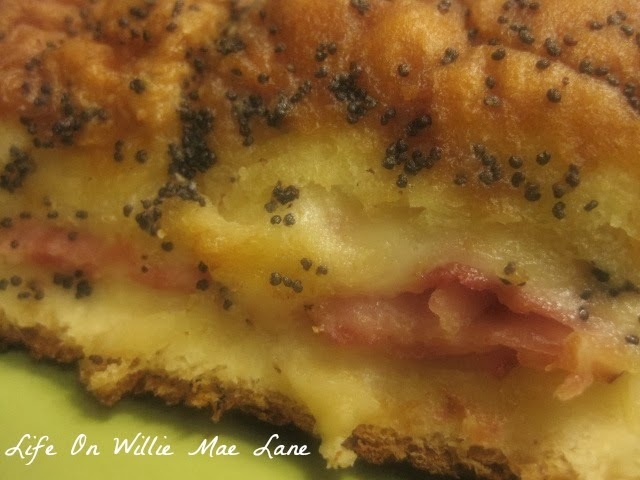 So, here's a recipe for you.....it's one of my favorites! Last, but not least, question number 4! Well, I wouldn't really call it a process...not for me anyway. I almost never plan a post. I mean, I might have an idea every now and then, but like I said above, I blog about my life and what's going on in it. So, I write about something that's currently happening in my life. I'm a very visual person as well, so I take (and share) lots of photos in my posts, since that's what I enjoy. 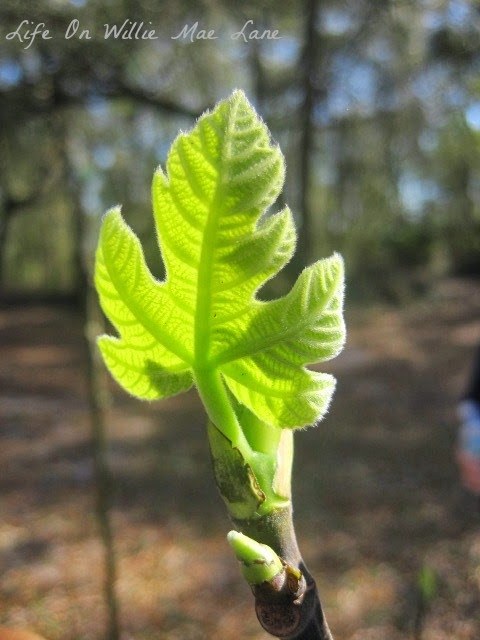 I love visiting blogs who also post lots of photos. 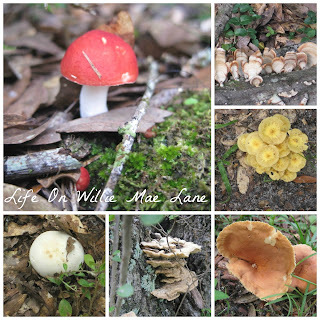 Here are a couple of my favorite photos.....I love photographing nature. As for my creative process, I am often inspired by things I see online or in magazines, stores, etc. I will use the idea and create my own version of it. Sometimes it's very similar and sometimes not. I see it in my head and then make it come to life. That's why my renovation has been so fun....I am finally getting to see all the pictures in my head come to life! It has been amazing....truly! I am blessed to have my own creative space to play in as well. It's one of my favorite places to be because it's such a happy place. 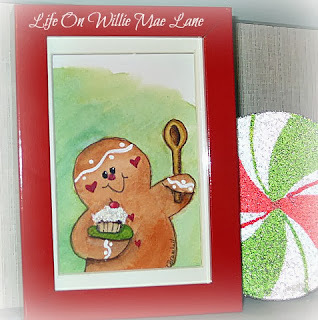 Check out all my craft room posts here. You might find me creating something like this sweet sewing basket. See the before photo here. 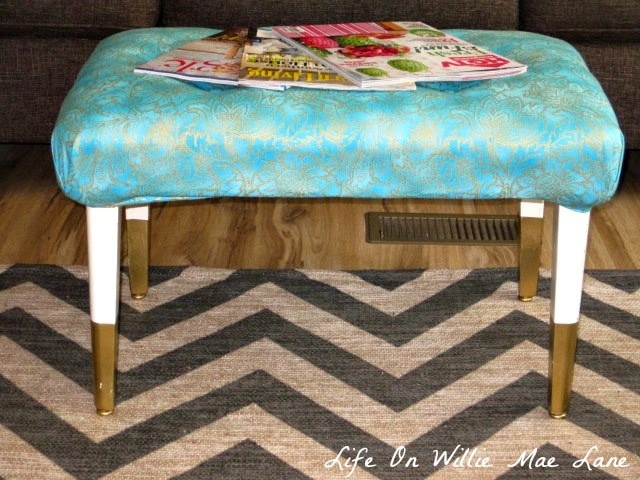 Or...maybe something like this little ironing board project! Whatever I'm creating, you can be sure I am having fun! It may not always turn out like my original vision, but that's usually because it turns out even better! Aren't they precious? I can't wait until Christmas gets here so I can unpack them and see their sweet little faces! You can read more about them here. And now, here's a face to go with the name. Cecilia is such a beautiful person...on the inside and out! 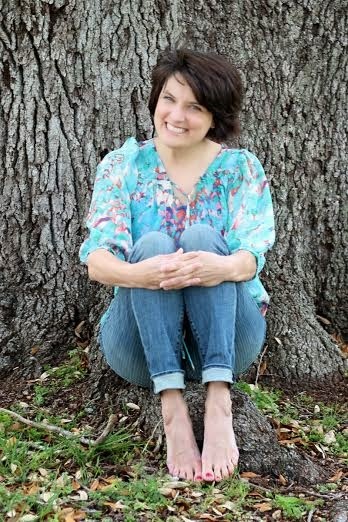 I just love this photo of her, barefoot in front of the big oak tree! Cecilia is an artist who loves to create and decorate. 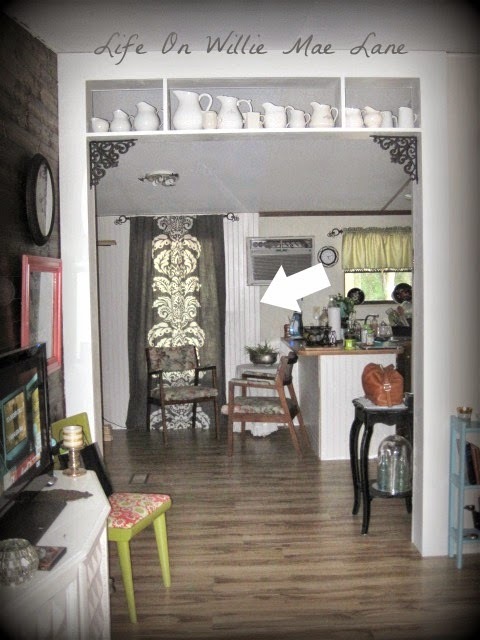 She started her blog "The B Farm" two years ago after buying the farm to document all the projects and improvements she and her husband made to the house and land. She looks forward to the day they move there permanently and she can have the art studio of her dreams. Cecilia will be posting her blog tour next Monday, the 25th. Be sure to go pay her a visit. You will love the projects she's always sharing. I always look forward to visiting and seeing what she has been up to. As always, thank you so much for stopping by. May your day be beautiful and blessed! I can't believe I have had time to blog so much recently. You may remember from my post on Thursday that I had mentioned gold dipping my ottoman legs to match the plant stand. Well, I am sharing it today. You can see my new sofa in the background. I love it! It came with the pillows you see on it. They are really nice pillows, but I do plan to make some new covers for them sometime soon. Anywho, my little ottoman is sitting in front of the sofa. It doubles as a coffee table. You may remember it from this post last year. I liked it still, but I wanted a pop of color in the living room since I have so many neutrals in there. 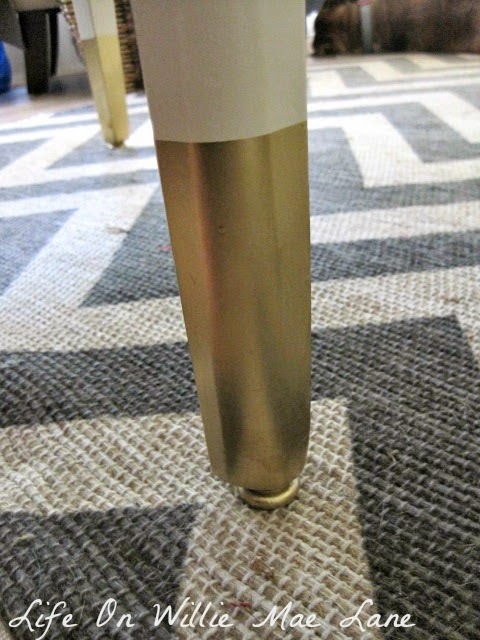 All I did was pad and tuft the top and paint the legs gold. I love this fabric. 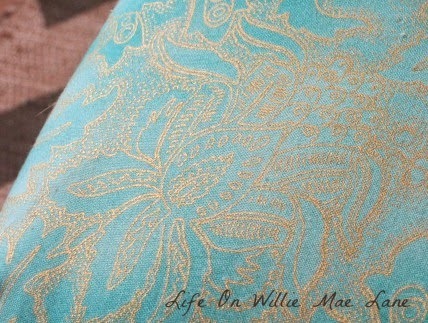 It has a gold metallic floral design on it....so pretty! I covered the buttons in the same fabric. I have never covered buttons before and was amazed at how easy it was! The tufting part wasn't so easy though! It wasn't that difficult really, just time consuming. Taping off the legs and spraying them gold was a cinch! 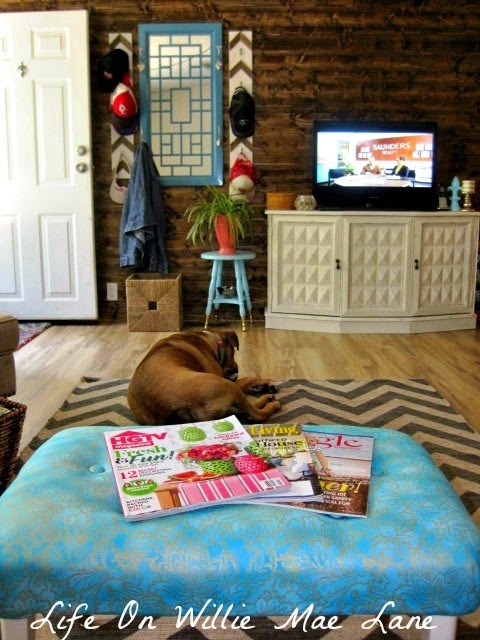 I am still loving my jute chevron rug! And here is a view from the sofa. If you didn't get a chance to read my created entry post, click here. The hubby and I still can't believe the transformation in our home. 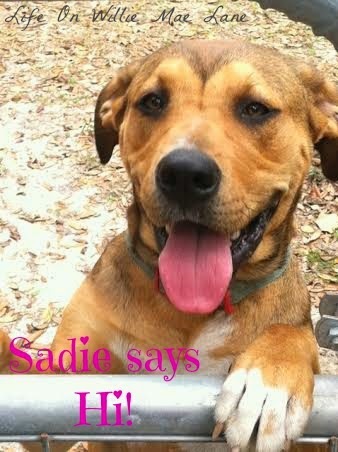 I love it more every day....Sadie does too! This post was short and sweet, but come back tomorrow and read my blog tour post. And if you missed my kindergarten classroom yesterday and want to check it out, click here to see it! Wishing you a blessed and beautiful week ahead! It's been a busy week and I am happy to have a couple days off to relax and refresh before I start teaching this week! One wonderful thing about teaching kindergarten is that we stagger start our kiddos. That means we only have a few each day and we do some assessments on them to see where they are academically. The first day for students is always an early release day, so kindergarten doesn't have any students that day. Starting Tuesday I will have about 6 per day for testing. The following Monday is when they start full time. We are over in our numbers and are looking at possible hiring a sixth kindergarten teacher. A little information about my school....we are in a high poverty area and almost 90% of our students receive free or reduced lunch. Our students come from very low socioeconomic homes. Many are being raised by grandparents because their parents are jobless (by choice much of the time), uneducated, drug addicts or are in jail. I am not exaggerating....it is very sad. But, the wonderful thing is that our school, in spite of all the challenges, is an "A" school. Florida schools are graded based on may different aspects, but primarily the student's standardized test scores. My school was the highest scoring school in the surrounding districts and not only that, we had higher scores that schools in other districts that are primarily high socioeconomic students. To put it simply....we ROCK! I work for the most amazing faculty and staff a person could ask for and we all care. We care that our babies come from homes that are less than desirable. We love them and care for them and offer them the best we can offer while they are in our care. We don't just assume that because they come from homes of uneducated parents that they can't learn. We know that they can and we have high expectations for these kids and they rise to meet our expectations. I am so blessed to have the job I have and I know that God put me right where He knows I need to be. With all that said, let me share my classroom. I am so thrilled to be in a bigger room this year. Last year I was in a tiny room and I had no closet. This year I am in a huge room with a closet! Oh happy day! This photo was taken from the back of the room, near the student tables and windows. The left side opens into the hall and this is the entry area where the student cubbies are. The computer area is at the front of the room as well and to the right is my meeting area. The kids sit on the rug for whole group teaching a lot. The whiteboard is to the right of the rug. The table and chair just in front of the computers is for my paraprofessional who will help during center time. This is the bulletin board above the computers. I divided it in half to hold my birthday board and my 5 Bees Promise. We have a bee theme this year in kinder and our hallway won the contest. Our principal has each grade choose a different theme from her list each year and this year was animals. We chose bees, and the other halls were ladybugs, swamp animals, flamingos, ocean animals, birds, and owls. They are voted on by the office staff. We were excited to win this year. Maybe I will share hall pictures soon. Anywho, I made the bees on the board from scrapbook paper...they are adorable! Above the board is my book jacket banner I made last year. Here is a closer picture of the entry. The board above the cubby will hold my students brag tags. It's a new reward system I am using this year. I am making tags similar to dog tags and the students will earn them for various things as well as get one on holidays, birthdays, when they lose a tooth, etc. They are going to LOVE it! The yellow charts are for my helper of the day. The kids rotate through being helper. I am calling it my hive helper of the day and they have a cute bee vest to wear all day. The red tub and striped bucket are for white boards and markers. The library area below isn't finished yet. I inherited about a thousand books I have to go through before I can finish this area. I will give many of them away and organize them by theme and label them by theme before I put them in the library. This helps the kids know where they go. The wooden door is the closet door. It is so big...around 6' x 10' or so. Lots of shelves too! I'm still organizing in there so no pictures! Here's my meeting area. We will have morning meeting here and phonics instruction, listen to stories and have calendar time here, among other things. Sometimes the students will sit on the rug and I will pull the screen down and instruct from my document camera. It's similar to the old overhead projectors, but it's in color and real life. They can see me writing and I can use math manipulatives, place a book under it, or anything. They are really cool! The area by the fridge holds puzzles, Lego's, and other toys for imaginative play time. Another view of the back of the room. The shelf behind the "U: table holds things I use to teach my small groups. It also holds the treasure box. Speaking of the treasure box, here it is. I bought it back in the spring but finally decorated it over the summer. The kiddos will love it! Check out my curtains I sewed over the summer. Yes, among all the remodeling, I worked on school projects too. The middle panel has the book character Corduroy Bear in a library setting surrounded by books. I thought it was perfect for a kinder classroom. I bought a coordinating stripe to border it with. I love how they turned out! My spider plant I potted over the summer and the adorable bee watering can for the kids to water it with sits in the library area. Across from the library area is the kitchen play set. There is also a small round table here that I painted with chalkboard paint. You can see my office space behind it. The office space really only gets used before the kiddos get to school and after they go home. Sometimes I use it when they are at PE as well. Not much sitting down occurs when they are in the room...lol!